Under the tracing rules, an entity and a corporation are grouped if the entity has a direct, indirect or aggregate interest of more than 50% in that corporation. Mr and Mrs Smith have a controlling interest in Orange Pty Ltd of 80%. This is called a direct interest. Mr and Mrs Smith and Orange Pty Ltd are a group. Mr and Mrs Smith also have a 50% direct interest in Black Pty Ltd. They also have an indirect interest in Black Pty Ltd. 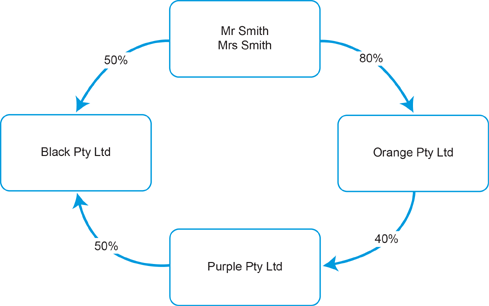 The value of their indirect interest in Black Pty Ltd is 16% (Mr and Mrs Smith's interest in Orange Pty Ltd multiplied by Orange Pty Ltd's interest in Purple Pty Ltd multiplied by Purple Pty Ltd's interest in Black Pty Ltd, which is 80% × 40% × 50% = 16% indirect interest). The total value of Mr and Mrs Smith's interests in Black Pty Ltd is the total of the direct and indirect interests: 50% + 16% = 66%. This is called an 'aggregate interest'. This means that Mr and Mrs Smith have more than 50% interest in Black Pty Ltd (a controlling interest). Mr and Mrs Smith and Black Pty Ltd are a group. As Mr and Mrs Smith are members of 2 groups, both groups form one larger group - Mr and Mrs Smith, Orange Pty Ltd and Black Pty Ltd are a group. In this example, Purple Pty Ltd is not part of the group, as no other entity has a controlling interest in it. Find out about registering for payroll tax. Find out how a change of status can affect your obligations.